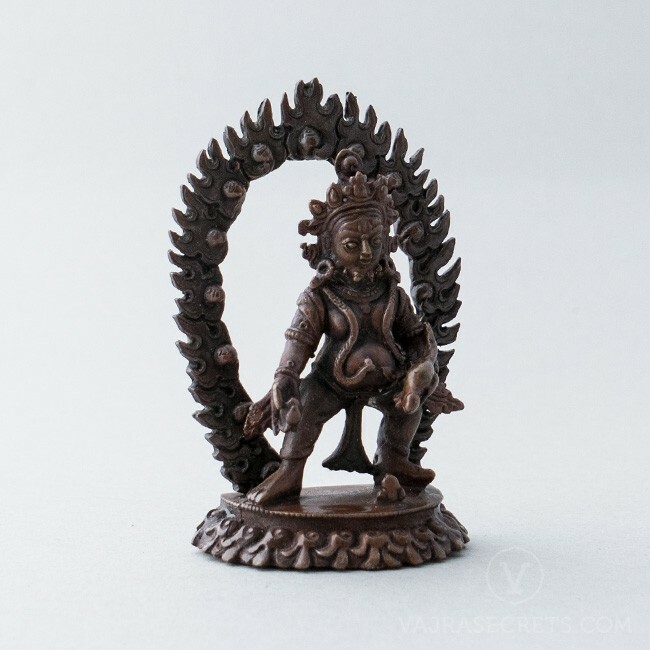 A 3-inch hand-carved copper statue of Black Dzambala, whose image brings spiritual wealth, helps overcome emotional poverty, and develops the mind of compassion. A perfect addition to a small shrine at home, in the workplace and especially in places of business. A 3-inch oxidised-finish copper statue of Black Dzambala, hand-carved by master craftsmen with full iconographic detail according to traditional scriptural sources. A perfect addition to a small shrine at home, in the workplace and especially in places of business. A manifestation of Buddha Akshobhya, Black Dzambala is sometimes called the chief of the five forms of Dzambala. He is a wealth deity whose practice can benefit those suffering from extreme poverty and the most dire situations. He also purifies bad luck and obstacles, prevents theft, bad debts and loss of wealth, and grants happiness and the fulfillment of wishes. 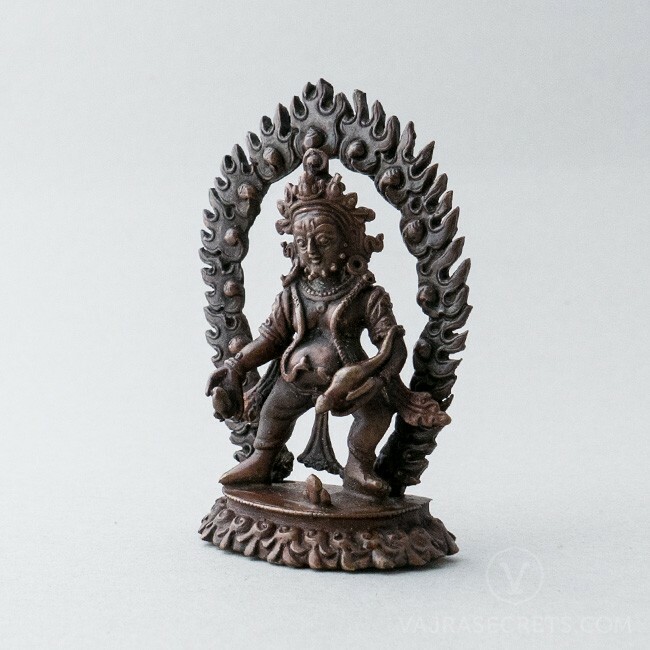 Also known as Kubera, the Hindu God of Wealth, every part of Black Dzambala's imagery represents increase and growth, from his stout pot-bellied form indicating wealth to the jewel-spitting mongoose in his left hand signifying the ability of his practice to bear fruit. He holds a skull cup (kapala) in his right hand and wears a snake necklace. Black Dzambala's blessings and the value of his practice are universal. Keeping an image or statue of him, or giving a Dzambala statue away as a gift is beneficial to anyone, anywhere. This Black Dzambala statue can be personalised with a hand-painted face using real gold dust or insertion of mantras and holy items. One can also offer brocade, pearls and semi-precious stones, as H.E. Tsem Rinpoche always encourages the practice of making offerings to the Three Jewels, which creates the causes for us to attain the six paramitas (perfections).